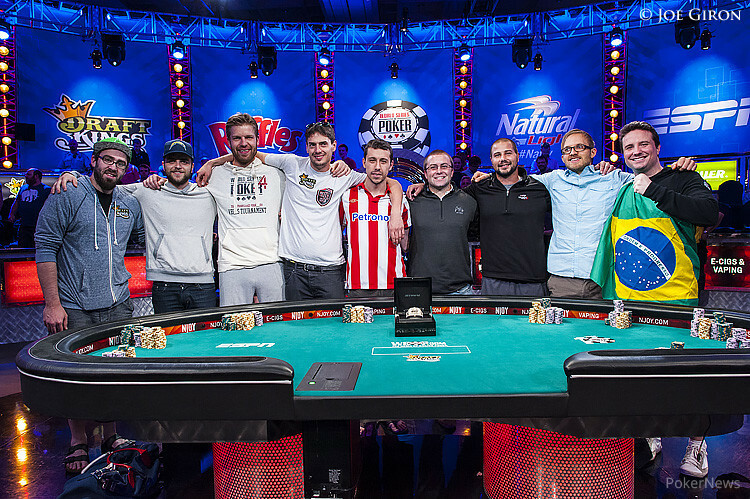 As you may have already heard, the 2014 WSOP Main Event final table is set as the original 6,683-player starting field have been whittled down to just nine players. The 2014 November Nine will reconvene on Nov. 10th to compete for a $10 million first-place prize. One notable thing that stands out about the field is how many different countries are represented, with Brazil, Netherlands, Norway, Spain, Sweden and USA all featuring a November Niner. WSOP 2014 November Nine is a pretty even playing field. The 38.375 million chips by van Hoof is just a little bit more than last year’s leader, JC Tran, who began the final table with 38 million. But in 2013, the distance from first to last was a lot wider, with ninth-place David Benefield only having 6.375 million chips. Given this point, it seems that anybody in the 2014 November Nine at least has a fighting chance at the $10 million payout. This thought is only further backed up by the fact that the final-table chip leaders are lacking in live tournament experience. The leader, van Hoof, has over 30 live cashes to his name, but none of them are very significant. Second-place Felix Stephensen, an online PLO specialist, only had two live cashes to his name before now. At 22, fourth-place Andoni Larrabe has an impressive $341,266 in career winnings already. However, he’s far from a seasoned champion. Is there a favourite November Niner for this year’s World Series of Poker? The only guy who could really be considered a favorite here, based on chip count and previous results, is Mark Newhouse. As the lone two-time November Niner in history, Newhouse gained incredible experience during last year’s ninth-place run in the Main Event. However, even with this being the case, Newhouse wouldn’t be considered nearly as much of a favorite as Tran was last year, with his chip lead and stellar results, or Jesse Sylvia was with his 14.5-million chip lead in 2012, or especially Jonathan Duhamel with his 19.5-million chip lead in 2010. Ultimately, only Duhamel went on to win the Main Event from this group of recent starting chip leaders. So the fact that nobody has an overwhelming edge in 2014 and there are no Tran’s involved means that it’s very difficult to predict a champion here.